For his father, see Ed Begley. In 2003, Begley wrote and directed the musical Cesar and Ruben. It was performed at the El Portal Theatre in Los Angeles and was revived in 2007. One of Begley's recent acting roles was in the CBS sitcom Gary Unmarried. Begley played Dr. Walter Krandall, the protagonist's former marriage counselor and fiancé of his ex-wife. Since 2008, he has appeared in a series of DirecTV commercials as a "Cable Corp Inc." executive. In 2013, he appeared on the reality television show Beverly Hills Pawn. As of 2019, he is starring in Bless This Mess. Since 1970, Begley has been an environmentalist, beginning with his first electric vehicle (a Taylor-Dunn, golf cart–like vehicle), recycling, and becoming a vegan. He promotes eco-friendly products like the Toyota Prius, Envirolet composting toilets and Begley's Best Household Cleaner. From 2007–2010, Begley and his wife Rachelle Carson starred in their own reality television series, Living with Ed on HGTV and Discovery's Planet Green channel. He, his wife and daughter Hayden are currently filming "On Begley Street", a Web series chronicling the deconstruction of his current home and the "building of North America’s greenest, most sustainable home". When Begley was a child, his future St. Elsewhere series' lead, William Daniels, met Begley Jr.'s father, Begley Sr., when the two were working on live television. By the time Begley Jr. grew up, he was already a fan of his mentor's work, before he would work with Daniels on St. Elsewhere, where the two had a wonderful on- and off-screen chemistry, together, for six seasons. Daniels, himself, on the show, was a moody Irishman like Ed Sr., though far more nurturing a father figure –– proved so rich, that the role grew beyond even the writers' expectations. Begley Jr. said about his future TV chief of surgery, "I was a huge fan of Bill Daniels. I had seen him in Two for the Road. I had seen him in The Graduate, and in Parallax View. He was an actor I just thought the world of. He played these 'Type A' personalities quite effectively, but (in real life) he is the sweetest guy in the world. During the 1960s Bonnie had left acting to take on a more important role...that of mother to sons Michael and Robert." He also added: "He is an actor I just thought the world of. I had no delusions about how my character came to be. I rode on the coattails of Bill Daniels... the kind of Mutt and Jeff routine of Dr. Craig looking up and berating a 6 foot 4 doctor Victor Ehrlich. So I owe all my success on the show to Bill Daniels." When the series was canceled, the two still remains friends to this day, living not too far away from each other. 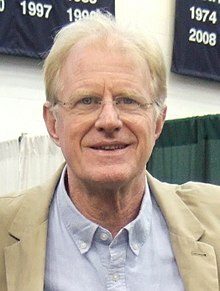 In 2002, Daniels, Begley Jr., along with the rest of the former surviving St. Elsewhere cast members, the late Stephen Furst and Eric Laneuville all appeared on an episode of Scrubs, in a forerunner of that previous show (that was mentioned). Not only did I enjoy working with him, but I see him fairly regularly. I just had dinner with him 4 nights ago. We had dinner together at Sarah Nichols's house, his neighbor of mine and friend of his. We had a lovely time and reminisced – he's unbelievable. He's going to be 100 years old this year—and still very active, getting around on his own. He's a force of nature, so Norman Lloyd was somebody I idolized. When I was quite young, wow, James Dean is great and this is one and that. Now look at Janis Joplin, what a great voice and Jim Morrison, those people left us so young, like my point of view has change somewhere, in the late 1970s and early 1980s, saying, 'No, you idolized Jimmy Stewart, Gloria Swanson.' The people that have families and happiness and a long, economy life. You know, Norman Lloyd, he wasn't much older than me, when I did 'St. Elsewhere,' and I went 'These are my rolemodels, now, people had a long/happy life and continued to be creative.' Those are my rolemodels, not the people that left us, so early and I'm sorry they did, I don't mean to trifle with that, but, my rolemodels changed from the people who had an incredible, brief spurt of creativity and life, but to people that went the distance, they became my rolemodels at some point in my early 30s really. 2018 The Cool Kids Karl Episode: "Margaret Dates the Zodiac Killer"
2018 Modern Family Jerry Episode: "Putting Down Roots"
2019 Young Sheldon Dr. Linkletter Episode: "A Nuclear Reactor and a Boy Called Lovey"
^ "Ed Begley Jr. biodata". filmreference.com. Retrieved January 17, 2017. ^ Koenenn, Connie (April 14, 1996). "Rooted to the Cause; Ed Begley Jr. shines in a world in which some stars are environmentalists only when the cameras are on. He lives what he preaches". ^ "Oscars: Board of Governors Election Results Signal Support for Current Academy Leadership (Analysis)". The Hollywood Reporter. Retrieved 2018-07-18. ^ Actor and environmental activist Ed Begley Jr. talks the talk and drives the drive, New York Daily News, 13 October 2008. ^ Celebrity Close Calls; retrieved June 19, 2011. ^ "Ed Begley Jr". thefreelibrary.com. ^ "Ed Begley Jr.: Actor and Environmentalist". VegFamily. Archived from the original on 2010-06-12. Retrieved 2008-08-19. ^ The Tonight Show with Jay Leno, April 25, 2008. ^ Begley, Ed Jr. "Twelve Things the World Should Toss Out: Lawns", Slate, May 8, 2010. ^ ABC News. "Eco-Friendly Competition: Who Can Go Greener?". ABC News. ^ Ed Begley Jr. Author Bookshelf - Random House - Books - Audiobooks - Ebooks. Random House. Retrieved on 2014-01-14. ^ Andrews, Avital (March 2015). "Taste Test: 9 Chefs who are Changing the World". Sierra. ^ "EMA - EMA". ema-online.org. ^ "Living With Ed". HGTV.com. Archived from the original on 2006-12-21. Retrieved 2006-12-27. ^ "2004 Racism Watch Calls On Bush-Cheney Campaign to Change or Pull Offensive Ad". Common Dreams. Archived from the original on 2012-09-15. Retrieved 2008-10-04. ^ 2004 Racism Watch Archived 2012-09-15 at WebCite, Commondreams.org, March 31, 2004; retrieved January 14, 2014. ^ Ed Begley Jr: Many Studies Link Fluoride to Reduced IQ on YouTube (2013-04-19). Retrieved on 2014-01-14. ^ Ed Begley Jr: Fluoridation is a "Clumsy Form of Medicine" on YouTube (2013-04-19). Retrieved on 2014-01-14. ^ "The Trivial Pursuits of Ed Begley Jr". November 8, 1984. Retrieved October 6, 2017. ^ "On Call, Vol. 1, No. 2 - Personnel Profile: Bill and Bonnie Daniels... "The Story of How Captain Nice Met Alice Actress"". stelsewhereweb.com. July 21, 2013. Retrieved October 12, 2017. ^ "Cloverleaf Radio Presents: Actor Ed Begley Jr "St. Elsewhere"!". BlogTalkRadio. 17 February 2014. ^ "Happy 100th to Norman Lloyd: The Ultimate Pro". yesweekly.com. Archived from the original on July 31, 2016. Retrieved May 18, 2017. ^ "'Young Sheldon' A Nuclear Reactor and a Boy Called Lovey (TV Episode 2019) Full Cast & Crew - IMDb". IMDb. Retrieved 1 March 2019. 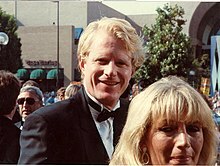 Wikimedia Commons has media related to Ed Begley Jr.. The TreeHugger Interview: Ed Begley Jr.
Interview from Log Home Design magazine: Ed Begley Jr.
Good Morning America covers Guide to Sustainable Living by Ed Begley Jr.